Security Situation In Turkey On November 26 – December 3, 2018 (Infographics) 5 out of 5 based on 3 ratings. 3 user reviews. On Dcember 3, the Turkish Interior Ministry released a new report providing a detailed look at the security situation in the country in the period from November 26 to December 3. 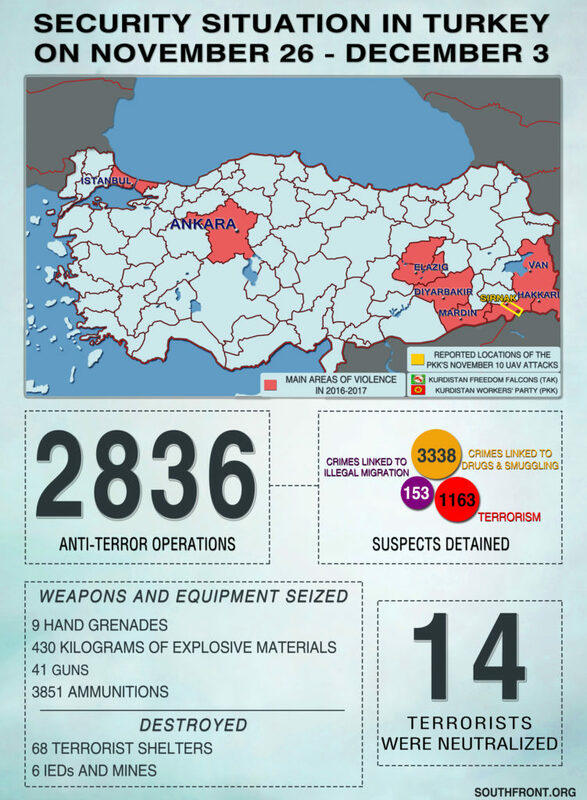 According to the statement, the Turkish Army and security forces carried out 2,836 anti-terror operations across the country “neutralizing” 14 terrorists. The army and security forces also seized 41 guns, 9 grenades, 3,851 ammunitions and 430 kg of explosive materials. Turkish forces destroyed 68 shelters belonging to terrorist cells as well as 6 IEDs and mines. Still going for that neutralized euphemism I see.